Please be advised that single node deployment on production should be done on virtualized infrastructure with HA/DR mechanisms or secondary (passive) node should be taken into consideration. There are very effective JLupin mechanisms in that keep service up & running and allow to manage it completely online (ex. zero downtime deployment) in case of the single node deployment, but they don't protect against hardware failure. Add a dedicated user (group) for JLupin software (ex. groupadd jlapp && useradd -g jlapp jlapp) and login using it. name: node1_1         # <-- !CHANGE! Change the paths accordingly to your environment if there are different than there examples. Add a dedicated user for JLupin software (ex. JLupin) and login using it. Unzip the package into the prepared directory. Now, you can enjoy operating JLupin PLatform as a windows service through windows administration panel or scripts available in c:\\Program Files\\JLupin\\platform\\start\\configuration\\controll\sbin\\. Due to security reasons, we strongly advice to change default set of certificates and keys distributed with JLupin Platform. Each instance of JLP has a server certificate and associated private key, located in $JLUPIN_HOME/platform/server-resources/ssl/server and a set of client certificates that are authorized to connect to the instance of JLupin Platform, located in $JLUPIN_HOME/platform/server-resources/ssl/client. Even each instance of JLupin PLatform may have it's own server certificate, but this way would be very hard in the scope of management and maintenance. We advice to expand this range, where one server certificate is common for each business domain, that is running on JLupin Platform (for example ebank). 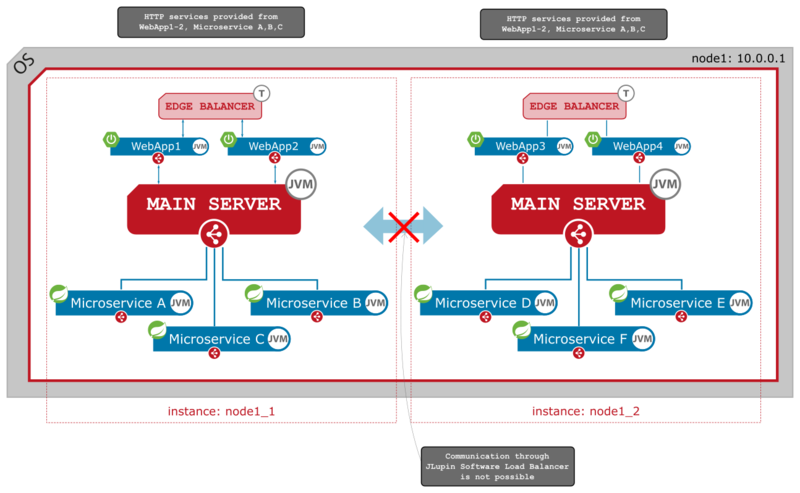 The first instance (node1_1) should be prepared in the same way as single node / single instance. name: node1_2         # <-- !CHANGE! server_name edge18000;      # <-- !CHANGE! and change the file name, if you want. server_name edge18001;      # <-- !CHANGE! Apply the port offset for all custom servers, if defined. Now, the second instance is ready to start. as show on the following picture. discoveryPeersDefaultAdminPort = "18889"    -- <-- !CHANGE! 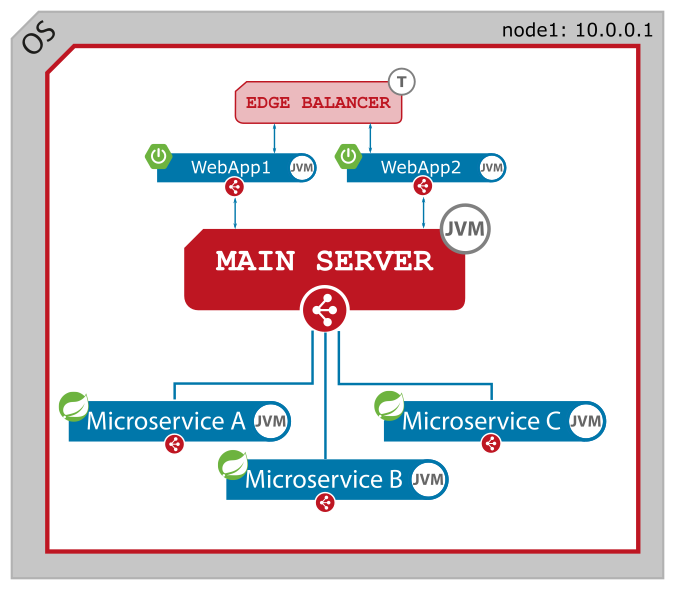 Of course, in clustered environment you can run multiple instances of microservices (along with single-instance microservice) and perform load balancing and failover between them. The example of such configuration is presented on the following picture.